Pub on the river in Wapping. 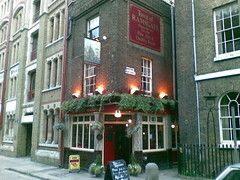 The pub is quite old; its current name is from 1811 and a leaflet they have suggests there was a pub on this location in the 1460s. It's quite nice inside, with little privacy screens along the wall opposite the bar. They have a projector on the ceiling, presumably for showing sport or something. It's possible to book tables. Pub quiz is Monday from 8:30pm, though it gets very busy when the quiz is on so get there early. There is a beer garden which looks over the Thames. The Adnam's Explorer at £2.85 was very drinkable. They also had Pride and Young's bitter, and also Leffe. Food is served noon-9pm every day. The menu looked okay. It's not cheap though. A sample menu we picked up on a Sunday in November 2007 offered Sunday roast (chicken, lamb or beef, £8.25), pie with roast potatoes, vegetables, and gravy (steak and ale, chicken and leek, or steak and kidney pudding, all £8.25), aubergine and walnut bake with roast potatoes and vegetables (vegetarian, £7), and ploughman's lunch (brie, stilton, or cheddar, £7). Desserts (e.g. apple pie and cream, bread and butter pudding with custard) all £4. Last visited by Kake, doop, Bob, Ewan, Kat, Adam, etc, 18 November 2007. Opening times, food times, and quiz night taken from blackboard outside on that visit. Last edited 2017-09-15 18:31:20 (version 22; diff). List all versions. Page last edited 2017-09-15 18:31:20 (version 22).